W surname names are some of the best. And while a few of them rank in the US Top 1000, many more remain undiscovered. They make great first names, and work beautifully in the middle spot, too. The W. of George W. Bush is for Walker, which feels a little more interesting than handsome, but predictable, William. Read on for some wild, wonderful W surname names. Originally a place name, Walden grew famous thanks to Henry David Thoreau’s writings at Walden Pond. He went there to live simply and pen a manifesto that still resonates more than 150 years later. Complete and nickname-proof, Walden feels serious, too. It conveys a respect for the natural world and a focus on intellectual pursuits. I’ve yet to write about Walden, but check back and I’ll update when I do. Walker put the Dubya in George W. Bush, a middle he shared with dad, inherited from George H.W.’s mother, Dorothy. (It was her maiden name.) 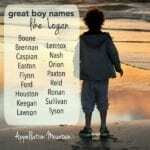 It fits right in with Carter and all of those ends-with-r names for boys. Back in the day, “walking” was part of the cloth-making process. Today, though, it feels active. Read more about Walker here. Long before Sam Walton made Wal-Mart a household name, Americans were captivated by a simpler life on Walton’s Mountain. The series was a television staple in the 1970s. The surname feels gentle and homespun, but also very wearable. It might be a great way to honor a grandpa Walter, too. Read more about Walton here. Ward means to keep guard. A ward of the courts is protected by the legal system. And we can ward off evil spells. As a surname, it originally referred to someone who worked as a watchman. The same is true of Warden, though I hear “prison” attached to warden, too. Ward Cleaver was Beaver’s dad on the long-running television series Leave it to Beaver. I’ve yet to write about Ward or Warden, but check back and I’ll update when I do. In the Legally Blonde series, Warner was Elle Woods’ not-so-nice boyfriend. It shares roots with Ward and Warden, but while those names are rough-and-tumble, Warner feels polished and preppy. Ivy League. That puts it in the same category as Carter and Parker and Hayes, popular choices all. I’ve yet to write about Warner, but check back and I’ll update when I do. It’s an Old English place name, and while Warrick begins with war, it’s more gentlemanly than aggressive. Actor Warwick Davis played Professor Flitwick in the Harry Potter franchise, as well as the Ewok Wicket in the Star Wars universe. Warren has appeared in the US Top 1000 every single year, so why not this similar-but-different choice? I’ve yet to write about Warrick, but check back and I’ll update when I do. With apologies to George, I’m not sure if Washington makes for the most wearable of surname names circa 2018. It’s not that presidential surnames are out of vogue – on the contrary, we love Kennedy and Taylor, Harrison and Ford. 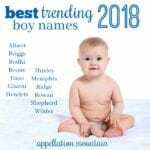 Lincoln recently made the list of fastest-rising boys’ names. And not so long ago, Washington qualified as a patriotic staple, right into the 1920s. Just 23 boys received the name in 2017. Still, Washington has too much history to exclude from a list of W surname names for boys. I’ve yet to write about Washington. We’re in the midst of a Sherlock renaissance. In recent years, we’ve seen at least three re-boots and updates, with three very different Sherlock Holmes – and even more different John Watsons, including one that was re-invented as Joan. Despite the high profile of crime-fighting Dr. Watson, it’s yet to break the Top 1000 – but it is on the rise. Watson comes from Walter, via the medieval nickname Wat. There’s something zippy and energetic about Watson, an unexpected choice that’s also instantly familiar. Read more about Watson here. Some occupational surnames immediately bring to mind the associated craft: Carpenter, Shepherd, Mason. Others feel more obscure, poetic even. I’d say Weaver manages to be both. We can picture a Weaver weaving, but it’s bigger than a simple task. It implies creativity and union, both positive concepts. Like Bridger and Ranger, there’s a lot of meaning behind this simple surname choice. I’ve yet to write about Weaver. Check back and I’ll update when I do. 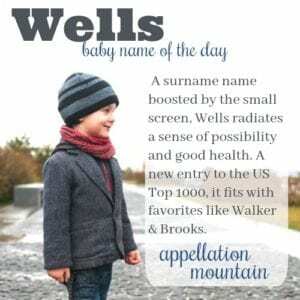 Wells debuted in the US Top 1000 this past May, a preppy name that brings to mind the natural world. And, because we think of words like wellspring and well-being, there’s a subtle virtue vibe to this choice, too. Maternity concierge Rosie Pope named one of her sons Wellington, but he answers to Wells. But credit for the name’s rise in popularity almost certainly goes to television series The 100 and The Flash. Read more about Wells here. Directional names seem rather stylish. So if Easton makes the Top 100, Weston can’t be far behind. And indeed, that’s true. To Americans, the West often symbolizes freedom and adventure, making the name even more meaningful. The Westin spelling brings to mind the hotel chain; West shortens things up, but would wear every bit as well. I’ve yet to write about Weston, but check back and I’ll update when I do. If Weston evokes the freedom of the American frontier, might Wheeler carry a similar vibe? To be freewheeling is to operate without constraints. I’ve yet to write about Wheeler, but check back and I’ll update when I do. Whitaker refers to either a wheat field, or perhaps a white field. Actor Forest Whitaker lends the name some Hollywood sheen. Like so many names on this list, it feels a little bit buttoned-down, even preppy. Nickname Whit has appeal, too. I’ve yet to write about Whitaker, but check back and I’ll update when I do. 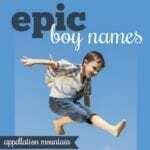 This is a fast-rising boy’s name, and a frequent favorite here at Appellation Mountain. Legendary writer-director Billy Wilder won Academy Awards for movies like Double Indemnity, Sabrina, Sunset Boulevard, and Some Like it Hot. It’s a daring name, a little bit of a risk. 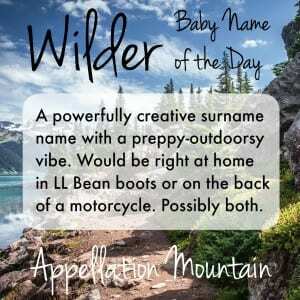 But in our age of aggressive boys’ names, Wilder isn’t so out there. In fact, it’s a nice mix of rugged outdoorsy can-do and a certain prep school vibe. Read more about Wilder here. In Gone with the Wind, Scarlett pined for her neighbor, Ashley Wilkes. Wilkes could come from a name meaning wolf, or it might be from a diminutive form of William. Today, Wilkes feels like a possible surname to promote to the first spot. Matthew Broderick and Sarah Jessica Parker have a son named James Wilkie,another possible variation of the name. I’ve yet to write about Wilkes or Wilkie, but check back and I’ll update when I do. Honoring a grandpa Bill? Wilson is another surname derived from the evergreen William. Despite the boom in ends-with-son boy names, Wilson languishes well behind Jackson and Harrison, though still within the Top 1000. Dozens of famous Wilsons come to mind, from The Beach Boys’ Brian Wilson to the 28th President of the United States, Woodrow Wilson. While some of the -son names feel a little bit rough-and-tumble, like Lawson or Stetson, Wilson feels polished and preppy, a brother for Emerson. I’ve yet to write about Wilson, but check back and I’ll update when I do. If you’ve ever caught a re-run of 1970s television staple M*A*S*H, you might connect this name with the privileged Major Winchester, called almost exclusively by his surname on the show. But that’s almost certainly forgotten. Today, Winchester fits in with our affection for names borrowed from the gun cabinet, thanks to Winchester firearms. If you’re crushed that Remington is rising, Winchester might be your name. I’ve yet to write about Winchester, but check back and I’ll update when I do. Winslow’s first syllable is the same element we know from Edwin- wine, friend. With an upbeat -o sound at the end, Winslow feels like a friendly possibility, especially in our era Leo, Arlo, and Mateo. Nineteenth century landscape painter Winslow Homer lends this name an artistic vibe, and a vintage one, too. And I can’t help but think of Winslow, Arizona, the tiny town immortalized in the 1972 Eagles hit “Take It Easy.” It’s a gentle name, but one with a lot of style and strength, too. Read more about Winslow here. While Winston almost inevitably brings British statesman Winston Churchill to mind, he’s not the only one. There are characters from Pulp Fiction, 1984, and Degrassi: The Next Generation, to name a few. And it’s appeared in the US Top 1000 most years, dating back well before World War II. It’s hard not to love the Win- syllable, and the name sounds capable and accomplished. Plus, it’s a place name, as in Winston-Salem, North Carolina. Drop the ‘s’ and you’ll arrive at Winton, or, as jazz musician Wynton Marsalis spells it, Wynton. They’re both Old English names with similar roots, but Winton is far more rare. Fox makes the current US Top 1000, so why not Wolf? Yes, it feels a little wild kingdom. But it’s a legit surname name, too, spelled with or without the final ‘e’. And traditional German choices like Wolfgang nudge it closer to first-name status still. CNN journalist Wolf Blitzer proves that the name wears nicely on a grown-up, and he’s not alone. It’s more popular than ever before, even though it’s still relatively uncommon. 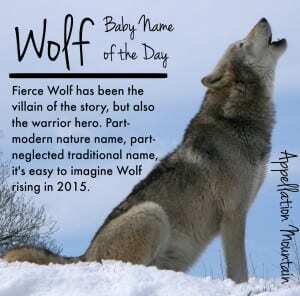 Read more about Wolf here. Wyatt is right at home in the current Top 100. Wyeth sounds almost the same, but I can’t find a connection between the two. Instead, Wyeth brings to mind the family of artists – illustrator NC, and son Andrew. Artist surnames are rich with potential, from Matisse to Avedon to Kahlo. So why not Wyeth? With the ‘Th’ sound trending in names like Theodore, I think it’s a winning choice. I’ve yet to write about Wyeth, but check back and I’ll update when I do. Is this too much like naming your child Marriott? It shares the upbeat first syllable win with Winston and company. While it’s rare, I’ve found a handful of men by the name. It’s also spelled Windham. I’ve yet to write about Wyndham. Check back and I’ll update when I do. 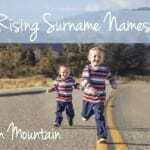 Which W surname names do you like? Are there others that should be on this list? Originally published on March 28, 2014, this post was revised substantially and re-posted on October 8, 2018. I love Wells for a girl! Wyeth is super cute too! Love all of the suggestions as well! I love Wallace nicknamed Ace! Also love Whitaker called Whit, Warren, and Warner. 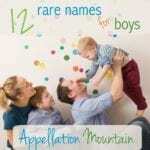 My favorite Surname name for boys isn’t on this list. Whitman. Nickname Whit. I’m a writer and Leaves of Grass is extremely important to me. We considered it for our son, but it just wasn’t right. I will definitely be putting it on the table again for kid no. 2 whenever that happens. Friends of mine have a baby boy named Willett. I adore it and him. I’m also a big fan of the name Willoughby for a girl — it’s so whimsical and pretty. Great additions to the list – thank you, Aela! First thing I thought of when she said “Wilkes”! Ashley may have been attractive in fiction, but in real life John Wilkes Booth was the man who assassinated Lincoln, and like many famous killers is always referred to by his three names. I suppose it might work outside the US, but I’d question the choice here. We are thinking of naming our baby due in July Walden! I also like Weston, Westley, and West. I’ve known a Washington (everyone called him Uncle Ingie), two Wellses (one was just Wells, the other a Wellington), two Westons, two Wilsons, a Winchester, and a Winston. I also have a family member named Webster, and I used to know a little boy named Wilkins. I’m kind of crushing on Wilkes right now, and I love Wolf as a middle name. What about Willoughby and Woodrow? They are probably my favorite W surnames. From the list I like Walker, Walden, Washington, Weston (I have a cousin named this), Watson, and Wolf/Wolfgang. A couple other W surnames that I like are Winthrop, Wordsworth, and Worth. I know a Waring (pronounced ware-ing, not war-ing), I think it’s a family name. Surprisingly wearable! How about Walllace? Not a very common name but I could see that changing (or perhaps as Wallis for girls). Wiley!!!! Wiley should be on this list as well. It is the name we choose for our son. I adore W names. Whitman and Wickham are some more that I like. My sister is expecting a boy and plans on using Weston (her previous choice was Walker, lol). If I were willing to go with a theme, I adore the name Wilder. I’ve heard it recently on a little girl and fell in love (but alas, too similar to Wiley). I also really like Wyndham (another Joss Whedon character name: Wesley Wyndham Price). I also really like Wellesley for a girl. HOW COULD I MISS WILEY! Of course … he should totally be on this list! My nephew is named Wylie, I love it! Definitely a name that could/should be on here. Also love Wilder/Wylder on boys. We nearly named our second son Winslow. I still think it’s a great name even though we chose another name. Oops, forgot to say you should put Warren on the list. It’s a common surname! I also know a cool guy named Wagner! Oh my gosh! I love this post! Your posts have been making me so happy this week! I adore Walker, Wells, Winston, Warrick and pretty much every name on this list! Walker is a family surname for me and Hunter is a family surname for my husband. We have both on our list for the next boy, but I much prefer Walker! I knew a very distinguished older man named Wells and always thought he had a nice name. W names are some of my favorites!